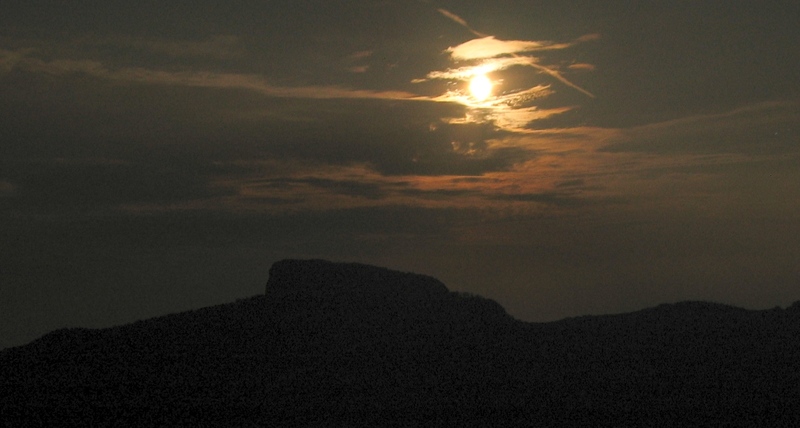 Recently on our special Halloween edition of The Gralien Report Podcast, I took time to discuss one of our group’s latest observations of strange earth-light phenomenon in the Linville Gorge wilderness, located near the towns of Morganton and Linville Falls in Western North Carolina. By their popular name, these strange illuminations that often resemble ball-lightning are known as “The Brown Mountain Lights.” However, to be more accurate, the odd glowing manifestations occur all throughout the region, and are seen under a variety of different circumstances, atmospheric conditions, etc (for more information about this unique phenomenon, visit this site). The recent viewing we discussed on the program involved a visit Gralien Field Correspondent Christopher McCollum and I made the evening of October 30-31st. The two instances of illumination we observed on this occasion did not appear to be rising above the tree line, as described in more remarkable eyewitness testimony reported over the years; nonetheless, we were able to see what appeared to be strange looking, white and amber-colored lights moving along the ridges and valleys below our lookout point at Wiseman’s View (a popular vantage for viewing the lights, located near the town of Linville Falls). ABOVE: Looking due North from our lookout at Wiseman’s View provides the same rough vantage depicted in this image; McCollum has included the approximate path which the object had been traveling. Google Earth doesn’t show where all the trails are, but some of them are included. 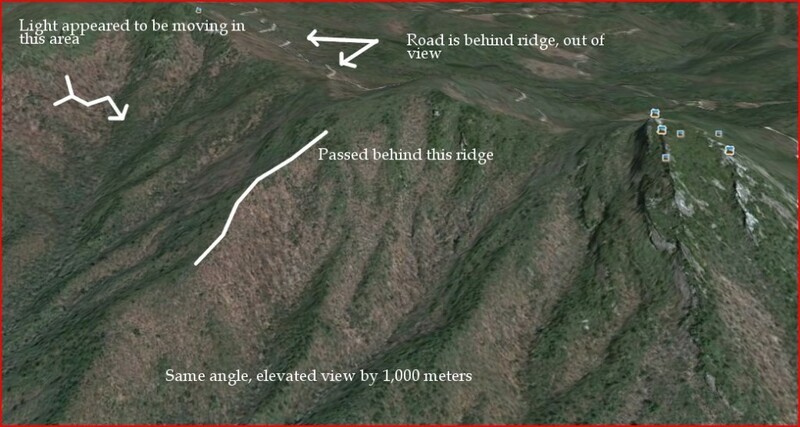 No significant trails are on the slope (see below). It does show where the roads are, and as you can see, the nearest road is on the other side of the mountain. I’m still not very sure we were looking at a car, and if the main access road through that area can be ruled out, it makes it even less likely. There’s still the possibility of it being an off road vehicle on a logging road or something… but there are no roads that go into the Gorge. We clearly weren’t looking at someone on foot, as it was moving far too great a distance in too short a period of time. For the second anomaly, however, there is a clear and distinct major trail that runs exactly where we were seeing the light. Could the illuminations we observed have been natural plasma manifestations, or would conventional explanations (including ATVs, off-road vehicles or cold-weather hikers) supply a better solution? Due to the distance between our location and the lights, (roughly two to three miles), it was difficult to make out any distinct shape or other features, since these illuminations never appeared above the canopy of the forest below. Thus, the likelihood that these lights were being produced by some conventional, man-made source must outweigh the alternative, for the time being. This does not, however, rule out the potential for the lights themselves being some as-yet unexplained phenomenon. The following photographs, taken by Bill Fox and Bob Ashmore, two associates of ours and fellow earthlight researchers from Pennsylvania, depict the more easily discernible light manifestations that many witnesses to the Linville lights have described. Note the changes in coloration, as well as the way the orb of light is hovering/moving well above the ridge line in the third photo (the mountain visible in the photos is the surface of Table Rock, which is actually a large, mostly bald ridge visible directly across from our vantage at Wiseman’s View). Finally, the fact that each image represents a long exposure creates the misleading effect of near-daylight in the photos; each was taken well after dark, with the moon plainly visible in the sky directly above the horizon. Finally, in the photo below, the one of the objects hovered above the North face of Table Rock before ascending in altitude slightly (the elongated shape of the light here is again the result of a long exposure distorting the light’s shape slightly, relative to the path it took as it moved). Note: I mildly enhanced some of the photographs above using brightness controls, so as to better outline the location of the landscape in relation to the objects being observed. All earth-light photos courtesy of Bill Fox, copyright 2009. Nice article! In my opinion I think that it is fairly safe to assume that 90% of instances like this are probably not anything “paranormal”, so to speak, and are more likely rare occurrences of a specific angle of light and weather etc. Planet earth is a very strange place and there are plenty of things that we as human beings do not yet understand. That being said, I do believe that there are instances like this that could very well be “paranormal”, that is it could be aliens or ghosts etc. Excellent report! Well written and the photos are impressive. 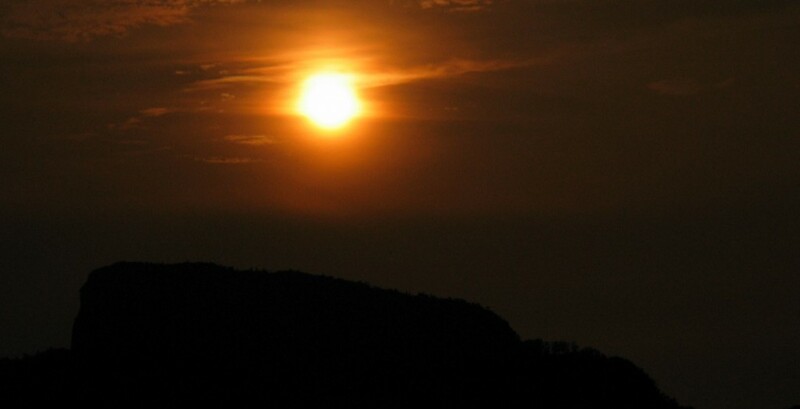 Wondering if Brown Mountain lights are affected by large earthquakes like Japan and Turkey? Web cam in the area would be so awesome!